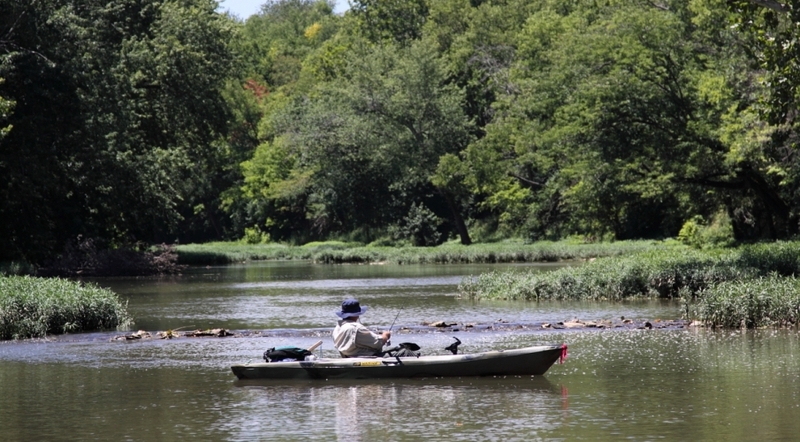 The South Fork of Licking River provides scenic fall paddling combined with good fishing for smallmouth bass and rock bass. Two floats on the river give paddlers an intimate sense of both the Inner and Outer Bluegrass regions of Kentucky. This article is the thirtieth in the periodic Blue Water Trails series highlighting the floating, fishing and tourism opportunities on Kentucky's streams and rivers. The pioneers settling along the verdant South Fork of Licking River in what is now Harrison County had a tenuous hold on their lands in 1780. The privations of carving crude civilization out of wilderness, the threat of attack by enraged Shawnee or their ilk, in addition to the whirlwind of the western theater of the Revolutionary War, all combined for a tough life. A threat emanating from the north in the early summer of that year would eventually bring terror to this corner of the world. British Capt. Henry Bird and his Native American allies moved south from Detroit, crossed the Ohio River and moved into central Kentucky, via the Licking River system. A number of families, many of them Pennsylvania German, lived along the South Fork of Licking River in Ruddle’s Station, near what is now Lair, Kentucky. Capt. Bird brought cannons with him and quickly blasted holes in the wooden fort, leading to its quick surrender. The invaders also took nearby Martin’s Station in Bourbon County and marched most of the captives from both forts to Detroit, where they remained prisoners until the end of the war. Two floats on the South Fork of Licking River give a modern Kentuckian an understanding why the pioneers braved such challenges to settle this pastoral and rich river valley. The canopy that envelopes much of the river provides spectacular scenery as the autumn colors reach their zenith. The gentle flow of the South Licking in fall makes a perfect autumn paddling destination, suitable for families and beginners. The river also holds a bountiful population of smallmouth and rock bass as well as largemouth bass and crappie in the impounded sections. The first float begins in Lair at the boat ramp beside the bridge over the river on Old Lair Road. The take-out is 5 miles downstream at the Terry Dam Ramp, also called the Airport Ramp, on Engineer Road via Infirmary Road and KY 982. Make sure to veer left onto Engineer Road just after crossing the railroad tracks on Infirmary Road to reach the ramp. The South Fork of Licking River braids considerably at the beginning of this float. The pockets of deeper water in these braids hold smallmouth bass at times. Paddlers may notice some abandoned brick pump houses on the right (looking downstream) just after launching. These are ruins of the Old Lewis Hunter Distillery which fermented its last batch of mash in the mid-1970s. Its main label was Old Lewis Hunter, aged 6 years. Distilling at this location began before the Civil War. As the days shorten and water temperatures drop, stream smallmouth bass migrate toward the deeper holes with less current where they spend winter. After the braided stretch of water, South Licking enters a series of longer, deeper holes that anglers should target in fall for smallmouth bass. As flowing water cools in autumn, smallmouth prefer lures with subtle action and a deliberate retrieve. A 4-inch finesse worm in black or hues of brown, green and gold does well. A 3-inch Senko-style soft plastic bait in the same colors that looks like a small cigar in the water also shines. The flowing water at the head and tail end of these deep holes is the place to catch fall smallmouth bass in South Licking. Simply toss these lures into this flowing water and do nothing but reel enough to keep your line tight and let the water move the lure until you feel the thump of a smallmouth strike. After a series of medium-depth holes interrupted by shallow bars, the river bends to the right and enters a long, deep hole. The flowing ends of this hole should be probed for smallmouth bass, while the sunken tree tops in the deep water hold largemouth bass. At the end of this long, current-free hole, Paddy’s Run enters South Licking on the right. The paddler enters a warren that provides great beauty from the changing leaves arching over the river. The river breaks into flowing braids for an extended stretch that require some dragging at low water before entering a deeper section. The deeper water marks the beginning of the pool formed by Terry Dam downstream. This transitional section is the best water on this float for smallmouth bass. The river soon slows to stillness and anglers may catch a few of the surprisingly big largemouth bass in this deep, placid pool. A weightless clown-colored soft plastic jerkbait rigged weedless and slowly fished in the many downed tree tops draws strikes. As the river gently bends to the left, look for the takeout on the left. The next float begins well downstream below Robinson Dam and ends just upstream of the low-head dam at the town of Berry. South Licking has many low-head dams, a remnant of a once vital bourbon distilling industry along the river. Low-head dams pose exceedingly dangerous conditions for paddlers and should be avoided at all costs. The put-in for this 5-mile float is below Robinson Dam, adjacent to the parking lot for the Robinson Dam Ramp off Robinson Road. This section has many mature trees, making a picturesque float with the fall colors. The take-out is on a small spur road off KY 1032, just across the river from Berry. The beginning of this float features many medium-depth pools that occasionally constrict and increase the river’s flow. These flowing areas hold smallmouth bass. Soon, South Licking bends to the right and constricts. A large swatch of water willow rings the right bank and a roar from water dropping in elevation greets the paddler’s ears. This stretch is the best smallmouth bass water on this float. Anglers should probe this water with a 4-inch pumpkinseed with green flake soft plastic lizard rigged on a 1/8-ounce leadhead. The deeper water just below the sharp drop, seemingly a long abandoned mill dam, is a good place to try as well. After a series of holes punctuated by rock bars, the river makes a hard bend to the left. The river gains some depth and soon stops flowing at all, reflecting the influence of the low-head dam at Berry. This transitional area is a fantastic fall spot to probe for smallmouth bass. The pool formed by the low-head dam at Berry is long and deep. The weightless soft plastic jerkbait works well in this stretch, fished in the abundant woody cover. The river then makes a long bend to the right. At the end of this bend, Raven Creek enters South Licking on the left. The woody cover in mouth of this creek holds largemouth, spotted bass and white crappie. A small, minnow-shaped hard plastic jerkbait worked near the woody cover scores all three of these species. After Raven Creek, paddlers should move to the left side of the river. Look for a log sticking out from the bank and a muddy foot path leading up the bank. This is the take-out. Detritus collected by the log makes the upstream side fairly easy to get out of a canoe or kayak. The low-head dam at Berry is just downstream of this take-out. Paddlers may also put in and paddle upstream for slackwater fishing for largemouth and spotted bass, catfish and crappie at Robinson Ramp just above Robinson Dam. The Cynthiana Boat Ramp on River Road near downtown Cynthiana and the carry-down access at the Pendleton County Athletic Park in Falmouth also provide access. Paddlers may continue upstream through these pools and catch smallmouth bass in their flowing headwaters. Cynthiana has abundant accommodations for paddlers. Thaxton’s Canoe Trails in Butler offers canoe and kayak rentals, shuttles and some private access spots along the river.